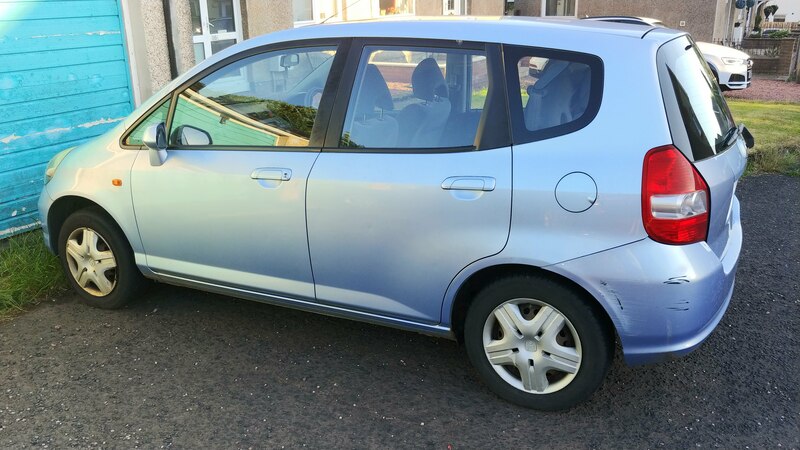 Last month I watched my long-serving Honda Jazz leave from outside my house, almost fourteen and a half years after I’d driven it out of the showroom in Liverpool, bound for the scrap yard. As the scrap merchant prepared it for departure, putting jump leads on the battery to give it some life, I busied myself clearing out the contents of the car, with Fliss coming over to help scramble items into either a bag of stuff to keep or one for the bin. With so many family memories centred around the car, I couldn’t help but feel sentimental at the finality of the moment. A few months before when its MOT had been due I didn’t think it was worth the money to get it through and, when the due date passed, I declared it “off-road.” Feeling that it had had enough money spent on it over the years – from a couple of pricey low-speed bumps in its early years to a brutal £700 bill to replace a failed door deadlock and the exhaust, I decided that it was now in the state that it wasn’t a worthwhile investment to keep it on the road. So the Jazz had sat outside the house for a few months getting weathered whilst I swithered over what to do about it. After declaring it off-road I couldn’t drive it anywhere, but I did start the engine a couple of times just to see if it would. One breezy afternoon in the spring the kids and I had sat inside to keep warm when we were out playing. Jason had sat in the driver’s seat a few times and pretended to drive it, as kids do. For both Jason and Elisha, the Jazz had been there since they first knew what a car was. In fact, both of them had made their first journey home from the hospital, safely strapped into their baby seat in the back, and would then enjoy family driving holidays all over the country in it as the years went by. It was hard not to let memories like that creep to the front of my mind as we sifted through the internal compartments salvaging things worth keeping. When all that remained was an empty shell, I jumped into the driver’s seat for the final time and fired up the engine after a couple of attempts. I had forgotten about the hole in the exhaust directly under the driver’s seat which emitted a throaty yet gutless rasp as I blipped the accelerator. Stepping away from the controls that felt so natural after nearly 100,000 miles of shared driving, I gestured to the scrappie that it was over to him and took the bag of things to keep into the house. My mother was waiting patiently to give me a lift, so I darted upstairs to change and watched out of the bedroom window as the scrappie reversed the Jazz out, attached a tow rope to the car of his partner and got set to leave. From my vantage point, I spied Jason watching forlornly from the porch of his mother’s house and I felt for him. He’s a sentimental wee guy, just like his dad, and we both watched with our heads bowed as our faithful transport rolled down our street for the last time. I’d taken a couple of pictures of the car to send to the scrap merchants so they could assess the condition of it, although how they could determine from them that £50 was all that left of the £10,400 it originally cost is beyond me. Those final pictures aren’t the way I want to remember my ice blue Jazz, though – all scratches and rust. I want to remember it as our first family car that took us safely and reliably on adventures, large and small. Looking past the issues that beset it in later years, I’d happily drive it home as new from the dealership and begin the journey all over again.